PS3 error codes are extremely frustrating for most PS3 owners and users, as most of the codes are not easily identifiable as to what they mean, and what the solution is. Below we have provided an evolving list of PS3 error codes and solutions that was compiled from several different message boards around the net. These lists are generally put together by PS3 owners and users who have had problems with errors and are trying to help others identify and fix those same errors. SEMPERTHREE would like to thank all the PS3 owners and users out there who have contributed to these various PS3 error code lists and will be making an attempt to identify, confirm and find solutions for as many PS3 error codes as possible. All confirmed PS3 error codes and/or confirmed solutions will be identified by bold red type. As this is a long and tedious process, we invite users of our site to share any relovent information about new or old PS3 error codes that they run across with us at: ps3errorcodes@semperthree.com. Moving forward we hope to provided PS3 owners and users the most up to date, FREE and complete list of PS3 error codes and solutions around the net. 80010001 - PS3 error code indicating a major hardware failure, Game ability stopped. 80010006 - Issue accessing file. File may be corrupt try erasing file and reloading. If problem persists, go to the recovery menu and "restore file system" as there may be a corrupt file. 80010007 - An error occurred during the start operation (during disc swap tests). 8001000B - Unable to access data from internal hd, external hd, thumb drive, etc.. This PS3 error code generally results from a bad connection make sure the device is plugged in securely or doesn't have any frayed cords or broken connectors. If problem happens with several different devices, then system may need repair. 80010017 - System unable to load game or game data from disc. Try cleaning disc and reinstall game data. If problem persists, go to the recovery menu and "restore file system" as there may be a corrupt file. 8001050B - Will not play demo hard drive games, (when blu-ray disc is inserted) - cause unknown. 8001050D - An error during the start operation; PS3 game swapped using the eject function and then play pressed quickly - PS3 game inserted again. 8001050F - Playstation Network is down. This PS3 error code appeared prevolantly when the PS3 internal clock error was found, apparently due to leap year, keeping most PS3's from connecting to PSN and playing online. 80010510 - Will not play games installed on the hard drive. 80010514 - System unable to read disc. Try cleaning disc or a different disc. If problem persists, system may need to be repaired. 80010516 - System unable to load disc. Try cleaning disc or a different disc. If problem persists, system may need to be repaired. 80023101 - Playstation Store password error. You should be able to go into account management and change your password to fix error. 80028E07 - Popped up when trying to update to firmware version 1.93 for some users. May happen with other firmware versions also. 80028EA5 - Problem connecting online. Try conneting at a later time as their may be heavy congestion on the network. Check network connections for proper settings. Try rebooting system, modem and/or router and then reconnecting. 80028EA6 - Can't download system software. Proxy server is set. Change network settings to turn off proxy server. 80028EA8 - Cannot connect to internet. PSN is down for maintenance or the ISP being used requires a login. Check with ISP for login information. 80028F10 - Issue with video settings on standard def TV. Go to Display settings >then Video Output and choose 16:9. 80028F18 - PS2 Disc Error, unsupported disc; eg. Utility discs, BB discs, IQ Remix game etc. ode). 80028F19 - PS2 Disc Error , fsck; the internal PS2 disk got corrupted and I guess that you can use HDD utility disc to fix it. 80028F1A - PS2 Disc Error , invalbnnetcfg; network config error. 80029023 - WEP/WPA encryption key error. Cannot connect to internet because encryption key is incorrect. Go to network settings and enter correct key. 80029024 - Cannot connect to internet. Check network settings. 80029301 - An error occurred during the delete operation (attempting to delete some ps2 homebrew from virtual mem card). 80029509 - When the PSN network is down for maintenance. Check back later. 80029513 - PSN cannot determine if system is authorized to play content. Make sure you are using account associated with content. Check to see if system is activated. Redownload the content from download list. If content is not on download list, then that account is not authorized to use that content. 80029516 - Sign in to PLAYSTATION-Network (needed for some games or Ps3 processes - have to sign in to use them). 80029564 - PSN DLC or game will not install - corrupted. Delete DLC or game and redownload again and install. 80029751 - Warhawk wont start but eveything else seems ok. No known fix. 80029945 - Can’t play blu-ray disc. Drive may need repair. 80029946 - Disc or files not recognized. File types not supported or disc scratched or dirty to the point that it is not recognized. Check to make sure file types are supported. Make sure disk is in playable condition. 80029C68 - Corrupt data usually on external device. Find and delete corrupt Data or device may need to be reformatted. 8002A10B - Shows up when trying to view friends trophies, profile etc. 8002A10D - Unable to Add friend in XMB. 8002A4A6 - Issue connecting to game server. Check network connections. Internet traffic could be too heavy. Connection speed could be too low. 8002A515 - Error Signing in. 8002A524 - System memory low. Reboot system. 8002A548 - Unable to connect or remain connected to PSN. Possible problems: Connection is too slow or intermitent. Your connection is NAT 3 or 4. Check your network settings. Internet traffic is too heavy. If you can remain logged into Playstation Store, then game may be faulty. 8002A705 - Network Server Timeout. Possible slow connection speed or heavy internet traffic with your ISP. Possible Port Error - Try opening ports , TCP port: 80, 443 and 5223 and UDP port: 3478, 3479 and 3658 or add Ps3 to DMZ. Also try making PS3 UPnP. Try connecting at later time. 8002AD23 - Problem connecting to PSN. Try conneting at a later time as their may be heavy congestion on the network. Check network connections for proper settings. Try rebooting system, modem and/or router and then reconnecting. 8002AD3D - Cannot Log into PSN - Is the PSN down? Try manually configuring your PS3 IP info. Try disabling media server connection in the PS3. 8002B241 - DVI has no audio. Solutions: Hook up audio via SCART connection or Digital Cable(toslink). 8002B71A - Possible NAT Error , Can log onto Game Server but can’t join game and can’t host game. NAT should be 1 or 2. Possible solutions; enable UPnP, put PS3 or router in DMZ or set ports, TCP port: 80, 443 and 5223 and UDP port: 3478, 3479 and 3658. 8002F994 - PS3 cannot update system software update. Redownload system update and install or try installing from game disc or usb drive. If system continues to have issues, it will need repair. 8002F997 - PS3 cannot update system software update. Redownload system update and install or try installing from game disc or usb drive. If system continues to have issues, it will need repair. 80030001 - Low memory or file coruption error. Try rebooting system. If that does not work then go to recovery menu and perform a "Restore File System" operation. If that does not work then you will need to perform a "Restore PS3 System" operation. THIS WILL ERASE ALL OF YOUR SAVED DATA! 8003041F - PS3 error code occurred during the copy operation (using media server). 80030517 - This PS3 error code seems to happen when you copy large media files. File sizes may be too large. 8003051E - Low memory or file coruption error. Try rebooting system. If that does not work then go to recovery menu and perform a "Restore File System" operation. If that does not work then you will need to perform a "Restore PS3 System" operation. THIS WILL ERASE ALL OF YOUR SAVED DATA! 80030920 - An error occurred during the copy operation, the file may be corrupt or there isn't enough memory (Try copying data from original source). 80031150 - "Setting information is corrupted.Press the x button to repair and restore default". 80031601 - Error Creating Account. Try creating account again. You may have to change information. 8013013D - Network connection timed out. Check network settings. WEP/WPA encryption key may be incorrect. 8013013E - Unable to connect to internet. Happens when either router or PS3 is set up for WPA encryption and the other is not. Set network settings for your router and PS3 to match. 80130203 - Connection timed out. Possible slow connection speed or heavy internet traffic with your ISP. Possible Port Error - Try opening ports , TCP port: 80, 443 and 5223 and UDP port: 3478, 3479 and 3658 or add Ps3 to DMZ. Also try making PS3 UPnP. 8013030F - Access Point not detected. Make sure access point is working and rescan. 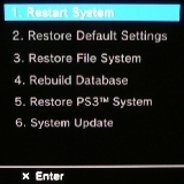 Try rebooting PS3 and reconnecting. 8041040F - Communication with the server failed. A DNS error has occured. Try alternate DNS. 80410418 - DNS Error. Try alternate DNS. 80410A0B - Issue with PS3 hardware. This is a major PS3 error code and generally requires system repair. 80710016 - Playstation Network is down. Try again later. 80710101 - Cannot connect to internet or cannot load web pages when using browser. Generally caused by incorrect network settings or a slow connection speed. Try resetting your network connection. 80710102 - DNS Error; Possible problems: DNS is down at your ISP. Wrong DNS entered. Possible solutions: Reset modem and/or router to have them pick up proper DNS. Check with ISP for proper DNS address and set manually. Use alternate DNS, some open source DNS's are available for free. 807101FF - Problem with hostname of PS3. Try rebooting system and reconnect. If still having issue, check network settings. 8071053D - Problem connecting to PSN. Try conneting at a later time as their may be heavy congestion on the network. Check network connections for proper settings. Try rebooting system, modem and/or router and then reconnecting. 80710541 - The connection to the server timed out. Possible causes: Connection speed too slow, server error or port settings need to be set. 80710723 - Network Server Timeout. Possible slow connection speed or heavy internet traffic with your ISP. Possible Port Error - Try opening ports , TCP port: 80, 443 and 5223 and UDP port: 3478, 3479 and 3658 or add Ps3 to DMZ. Also try making PS3 UPnP. 80710A06 - Undescribed issue with PS3 system. This error has been encountered during the install operation (error when downloading game from PSN - network error occured). May have tried to install corupt data. 80710B23 - Network Server Timeout. Possible slow connection speed or heavy internet traffic with your ISP. Possible Port Error - Try opening ports , TCP port: 80, 443 and 5223 and UDP port: 3478, 3479 and 3658 or add Ps3 to DMZ. Also try making PS3 UPnP. 80710D23 - Network Server Timeout. Possible slow connection speed or heavy internet traffic with your ISP. Possible Port Error - Try opening ports , TCP port: 80, 443 and 5223 and UDP port: 3478, 3479 and 3658 or add Ps3 to DMZ. Also try making PS3 UPnP. 81019002 - Error copying saves from location A to location B not open to connect to store but PS3 can connect to internet. Copyright © 2010 SEMPERTHREE. All rights reserved.